As you can see, I'm here with Olivia Crouppen, my alternative baking expert. And she is going to show you how you can make an incredible vegan cheese. to pizza, tacos, or even grilled cheese sandwiches. and melting on all of your favorite savory dishes. Made in the blender in just minutes, you too can make this cheese easily at home. Okay, so to start off our vegan cheese, we're going to be using soaked cashews. These are raw cashews that I've soaked overnight in hot water. You don't have to soak them that long, you can do it for just an hour if you want. But it's super important not to skip this step. If you happen to be allergic to cashews or you don't like them so much, totally fine. You can go ahead and use almonds. can flavor the cheese as we like. So we're just going to get this into our food processor. In that case, it added almost like a gluten effect to the flatbread. In here what it's going to do is create that stretchy, stringy cheese. Next up is coconut oil. I love coconut oil as you guys know. So I'm just going to get that in there with my spatula. So this is the secret ingredient in my vegan cheese. Agar agar is a vegan gelatin and this is a super important ingredient here. what makes the cheese work when it's melty and also set up when it's cold. So we're going to get that in here. and Moss, which is another vegan gelatin, you can absolutely use that instead. more creamy where as Carageen and Moss makes it a little more hard. to go ahead and flavor our cheese. You'll often times see this in salad bars for sprinkling over your salad. The reason is because it tastes and acts kind of like parmesan. So we're going to get this right in here. So the final ingredients in our vegan cheese are salt and lemon juice. If you like it more on the neutral side, you can just cut down here. I you don't have a food processor, you can also use your blender. So we're just going to get the top on here and go to town. I'm going to go ahead and turn on my machine. I'm just going to let it run for a good one to two minutes. You just want make sure that everything is nice and combined. So I'm just going to pop the lid on and take it a little bit farther. Again, what you're looking for is just a super rich and creamy texture. The last and final ingredient in our cheese is actually just water. This is some water that I just boiled. This is about a cup and a half of water. If you want your cheese to be a little softer and more creamy, add the full amount. But I want it to be a little harder, you can hold some back. So what we're going to do is turn on our food processor and slowly stream this in. Our cheese mixture has come together, and now we're moving on to our next step. We're just going to pour our cheese mixture into a medium saucepan over medium heat. And what you want to do is whisk consistently for just one to two minutes. What you'll see is pretty magically after two minutes, it'll start to thicken up. Okay, so now that our cheese is cooked, you can totally enjoy it like this. So what we're going to do is get it into a small bowl. make sure that cheese will release. that along the bottom of the bowl so we can just lift our our cheese. So all we're going to do is get our hot cheese mixture into here. to gently press it down and smooth everything out. cheese out, it looks nice and smooth. So this is already starting to set up. So from here, all we're going to do is get this into the fridge. This is the cheese that I made yesterday. As you can see, it's set up and nice and firm. So all that we're going to do is turn it out onto our plate. So you'll see this is super easy. We're just going to ue the parchment paper to lift the cheese. And then get it onto our little plate situation with cheese and crackers. Check out the finished cheese. I love it when it's hot. I love it when it's cold. So all that's left to do is give this a try. I cannot wait slice into this. I've got some crackers here. I think I know someone who might like to give this a try. You know, I've never had a vegan cheese before. Liv: Well tell me, if you didn't know that it was vegan, would you ever be able to tell? Liv: I haven't tried this either. It's salty and it has the texture of a spreadable cheese. Almost like a rindless brie. Honestly, it really does have the flavor and texture of a brie. 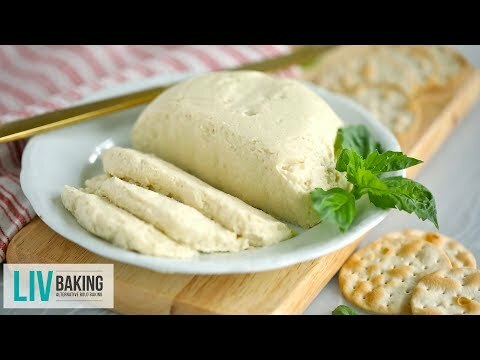 I can't wait for you guys to give this vegan cheese a try. The recipe is on BiggerBolderBaking.com.